This product transforms stubborn sticky phlegm and relieves stubborn coughs. As the patent is specially and carefully blended, it is particularly effective for anti-phlogistic, anti-phlegmatic, anti-feverish, and anti-laryngitis. Use for accumulation of phlegm heat, marked by severe rattling cough, expectoration of sticky yellow phlegm, difficult breathing, and esophageal congestion. Use for acute and chronic phlegm heat cough and bronchitis, asthma, emphysema, and smoker’s cough. Also useful for sore throat and laryngitis. This product transforms stubborn sticky phlegm and relieves stubborn coughs. As the patent is specially and carefully blended, it is particularly effective for anti-phlogistic, anti-phlegmatic, anti-feverish, and anti-laryngitis. This drug carries no side effects. 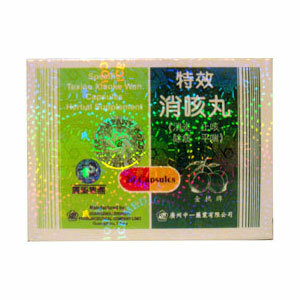 Transforms phlegm, nourishes lung yin, clears heat, relieves cough. Use for accumulation of phlegm heat, marked by severe rattling cough, expectoration of sticky yellow phlegm, difficult breathing, and esophageal congestion. Use for acute and chronic phlegm heat cough and bronchitis, asthma, emphysema, and smoker’s cough. Also useful for sore throat and laryngitis. Take 2 capsules, 2 to 3 times a day with warm water. For children, take half the dose or break open capsules and mix in warm water.